The Chesterfield County Dash In is part c-store, part grocery and part restaurant. Dash In, a convenience store chain with over 50 locations in Maryland, Virginia and Delaware, has always prided itself on pushing the boundaries of what it means to be a convenience store. In-store foodservice and highly designed spaces are a big part of its ethos. In April, Dash In, which is owned by The Wills Group, Inc., opened a new store in Chesterfield County, Va., that pushed things even further with a big store that blurs the lines between grocery stores, restaurants and convenience stores. The store is 5,600 square feet, features an extensive craft beer program, an open kitchen and bar, and convenience or gas station staples like a 24-hour car wash and 16 fueling positions. It’s not your average pit stop, but executives insist it’s not a grocery store either. “When a consumer visits a grocery store, that is usually their final destination, and time doesn’t serve as a major constraint,” said Darleen Nascimento, director of brand marketing at Dash In. 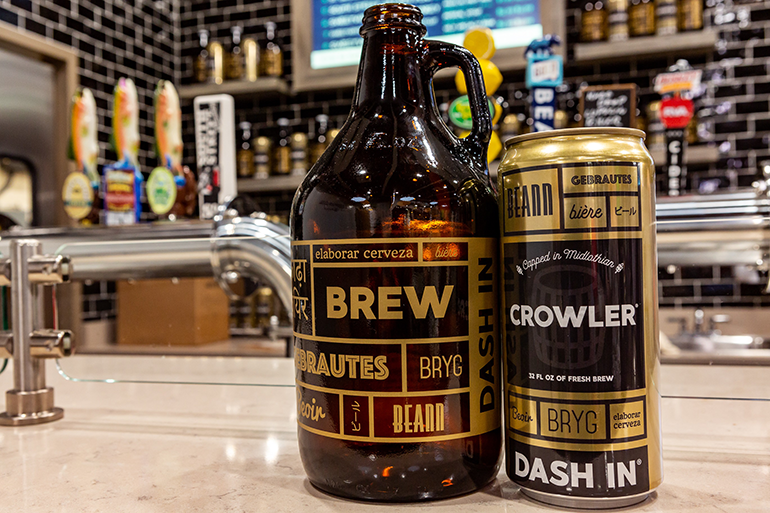 Dash In customers can buy Growlers to go, or stay for a beer or a glass of wine. Inside the Chesterfield County store, customers can grab a Memphis pulled pork sandwich, cranberry chicken salad and a growler of local beer to go. Or they can stay awhile, pull up a seat at the industrial-chic seating area, tap into the free wi-fi and order a Virginia wine — yes, there are wineries in Virginia. Of course, this is still a convenience store, so doughnuts and an all-day breakfast menu are also on offer. And coffee is a top seller. “We are looking to try some new test coffee concept ideas next year,” Nascimento said. The concept store is the result of three years of market and consumer research, said Nascimento. And the new location helps with R&D for other sites. Dash In plans to open multiple concept stores in Delaware, Maryland and Virginia in the next few years. But each space will reflect the neighborhood and its needs, said Nascimento. The Richmond-area store caters to "time-stretched people" like young professionals and young families.